It’s the last week of term. Finally! I thought it would never arrive, but after almost four months of what can fairly be described as the Kraken of the semester world, insofar as it has wrapped me up in its tentacles, refused to let me go, and almost succeeded in dragging me down into the tenebrous depths of despair, I no longer feel like the Jules Verne of depression, but can make out the surface glimmering above me. This Saturday, I’ll be back in the UK, left with the slightly uncomfortable realisation that half of my Year Abroad will have just elapsed. I’m choosing to ignore this, and instead try and be excited about Christmas. Go to a Christmas market a good distance away from your classroom. Jump on the tram back to class. See off aforementioned wine faster than you normally would whilst on the tram. Spend the first half of the class in a not-unpleasant daze, vaguely listening to what is going on, but not really. Sober up with half as much boredom as you had originally anticipated. Clearly, those out there who pride themselves on their ability to drink more alcohol than that necessary to knock out a bull elephant might struggle to achieve the same result with just one cup, but I’m sure that quantities can be adjusted as necessary. Also, please bear in mind that I wasn’t actually sloshed in class; that would have been hideously disrespectful. I just felt slightly more relaxed and cared less that the class was slow. There are a couple of Christmas markets that have popped up in Lyon recently, full of stalls that sell artisanal products or tat, depending on your levels of optimism/goodwill to all men/saturation with vin chaud. Walking through them all wrapped up in the evening is pleasant, and makes you feel a little bit festive, but in general, other areas of l’hexagone are better known for how they do Christmas. I’m talking the Alsace, and more specifically, Strasbourg. If you look in the right places on the internet, you can find a website, sadly not the type where you can find the Frisky Frauen of the Alsace or a pretty quiche-looking Lorraine, but rather one that tells you that Strasbourg is the “Capital of Christmas.” This is not just a bad translation, because the French and German versions of the site translate it as la capitale de Noël and Weihnachtshauptstadt respectively. Asserting oneself as the veritable centre and pinnacle of what Christmas can be is a very bold claim to make, and I’m sure that the Strasbourgians, or however they call themselves (it’s Strasbourgeois, according to Wikipedia), find justification for this statement in their many busy Christmas markets. I therefore went on a foray out there with a couple of friends to try and get more into the spirit of the season, reasoning that its proximity to Germany would yield quaint architecture, hearty food and perhaps the opportunity to blow the cobwebs off my A-level in German. in the world boasted nothing that I hadn’t seen before. The wares sold in the prettily decorated sheds lined up back-to-back in the Place de la Cathédrale, or hemming pedestrians in along one street or another, seemed to follow a rotation of model houses, jewellery or exotic blends of tea, and even one market that promised culinary specialities of the Alsace proved to be nothing more than foie gras, pretzels or biscuits being sold by at least ten stalls each. Actually, I’m being unfair: some of the more renegade stalls sold Flammkuchen. I do feel somewhat guilty for finding fault in supposedly one of the best places in Europe to feel Christmassy; after all, the lights and the decorations on the upper levels of shops on the main shopping streets were tasteful and enchanting. A 5am start, choosing to visit on a Sunday, and miserable grey weather could also have contributed to my less than amorous first impression of the town. Even with that in mind, however, I’ve seen better. I went on a school trip to Berlin three years ago almost to the day, and I preferred the markets there. Strasbourg was just full to the brim with tourists searching for the magic of Christmas, and although it was lovely to go on a trip with friends to a distant and admittedly pretty location, it would, ironically, probably have sold itself more to me had I seen it in summer, minus festive hype. But of course, as a student with just one year to try and see as much as I can of the vast country that I have come to consider as my temporary home, I was inevitably going to choose Christmas to pay (rather extortionately) my visit, and a return visit is looking doubtful. 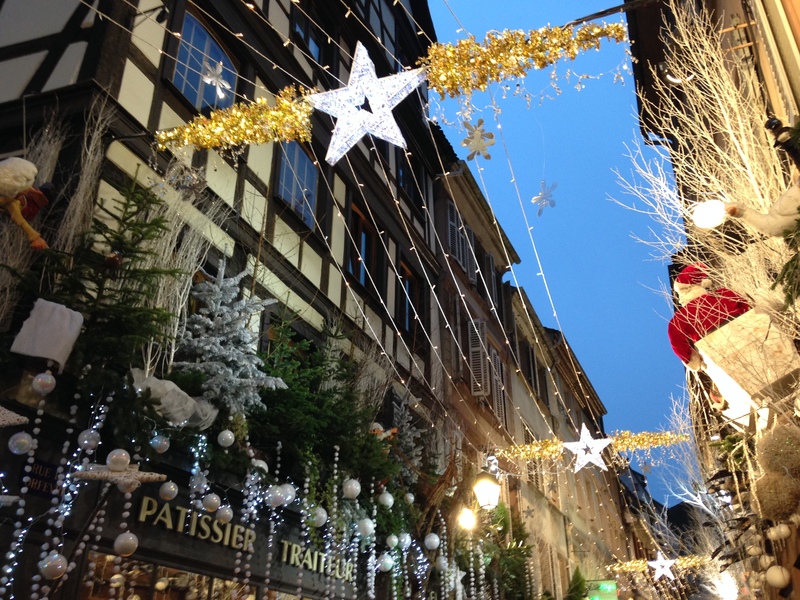 My disillusionment with Strasbourg may of course be linked in part to my slow-burn attitude to festivity in general. It takes me a while to warm up and get excited, and sometimes I don’t quite manage it before the Big Day itself has been and gone. When I was younger it was easier: we lived in a village, close to lots of places perfect for wintery walks, Santa existed and of course, Christmas telly was a constant source of joy. Now I live in a town, I can’t stomach the idea of watching The Grinch or Elf ever again, and wintery walk opportunities manifest themselves in a brief jaunt across a park full of despair and derelict skateboard ramps, where you’re so busy looking over your shoulder that you don’t notice the festive poo lying in wait, left by the Staffordshire Bull Terrier of Christmas Past, until it’s too late. If you’re lucky, the gift you hastily try to wipe from your shoe might contain the bones of a small child. Joyeux Noël. It’s not that bad. I’m certain there hasn’t been a child-eating in Grantham recently, and quite a nice stately home good for walks can be found just down the road. My point about slow burning remains though. Occasionally I need a bit of a Christmas catalyst to kick-start the excitement. I always used to enjoy going round the Lincoln Christmas market when I was younger, but I’ve come to realise how crowded that gets. Still, it was something that made me feel a bit Christmassy close to home, and that was pleasant. This might seem a little irrelevant, but in Lyon a couple of weekends ago I had a similar experience. 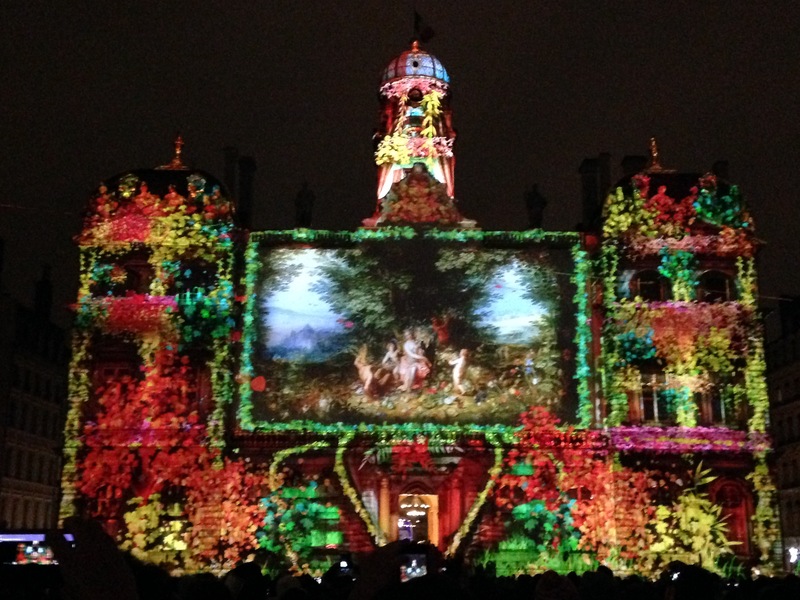 The weekend of 5th-8th December, Lyon saw itself transformed by the Fête des Lumières. Originally an event to commemorate the Virgin Mary banishing the plague from Lyon, in which residents of the city put candles on their windowsills as a token of thanks, in recent years the festival has gone large-scale, attracting millions of visitors in a flurry of spectacular colour and light. Alarm bells may be ringing for some at the mention of “millions of visitors,” and this is well justified: the crowds verged on intolerable. Streets where one can easily be the only pedestrian on the pavement during a normal weekend were thronging with such dense levels of human life, both from Lyon and elsewhere, ambling, jostling, pram-pushing their way towards various light features in the centre of town, that sometimes entire areas of the main shopping streets came to a standstill. On one occasion I remember standing in a stationary crowd of people on a road where there wasn’t even anything to see, but the queue to see whatever lay in the adjacent square was so gargantuan that it had sprawled outwards into neighbouring thoroughfares. Add to that the biting cold and draconian crowd-control measures installed by the event organisers, which involved blocking off certain entrances to roads or squares and even the metro, and you have a claustrophobe’s worst nightmare. The amount of people actually made me feel lightheaded. The metro was also subjected to a bizarre one-way system in the busiest areas, forcing travellers to leave the station and re-enter by a different entrance, even for very simple line changes. For many of the Lyonnais, the Fête is four days of frustration: people are not only sad that a tradition peculiar to their hometown has been so shamelessly hijacked in the name of profit, but many also because visitors who travel great distances to Lyon with high hopes for the Lumières go away disappointed, with an unfortunately bad impression of the city, remembering more keenly the insufferable crowds than the spectacular lights. Happily, this by no means spoiled the Fête for me. My wonderfully hybrid position as half-local, half-temporary-visitor meant I was probably keener to see the lights than the average resident of the city who sees the lights and the accompanying plague of tourists year in, year out, but also allowed me the privilege of time that other visitors to the event were denied. What others had to cram into one evening, I could see in four. In the end, I made it out into town every evening except Sunday. I didn’t see everything, but what I did see was magnificent. One evening took me on a fantastical walk through the Parc de la Tête d’Or, transformed in the darkness, where lanterns hung from the trees, glowing wraithlike characters paced through the foliage, and the instead of birds, huge fish tumbled silently overhead, illuminated, long fins billowing in the night air. The next evening took me on a foray into the seething crowds, but I was rewarded by wonderful spectacles at both Place des Terreaux and the Cathédrale St Jean, where images were projected onto the faces of the buildings to a music soundtrack, changing their colour and bringing them to life. I don’t think I’ll ever see a cathedral throb in the same way again, or watch ballerinas and break-dancers get their groove on with quite such enthusiasm as those projected onto the 18th-centry façade of the Hôtel de Ville. The spectacle at the Place des Terreaux was impressive enough to make me quite emotional. That might have been partially down to my exhaustion and relief at having finally wrestled my way through the crowds to see it, however. On Monday, many families put up lumignons (rows of candles) in their windowsills, and there was a firework display, of which I caught the latter half before heading to Place Bellecour to watch another light show. 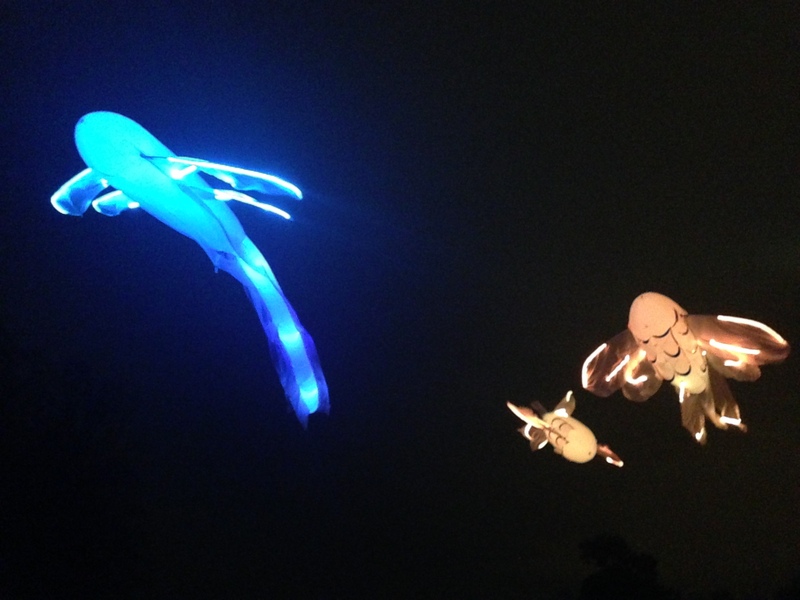 Rêves de nuit (“Night Time Dreams”) was a piece that paid homage to the famous Lyonnais Antoine de Saint-Exupéry, aviator and author of Le Petit Prince. As the audience watched, Tonio, perhaps a young Saint-Exupéry, took off on his winged bicycle and flew to the far corners of the world. Again, the accompanying soundtrack provided brilliant storytelling, and there were even acrobats, suspended and somersaulting fifty feet above the ground. I felt quite sorry for them, because it was freezing, and spitting with rain. The show ran on a loop every twenty minutes or so, so I imagine they must have had to get hoisted up into the firmament far more often than they would ideally have liked. Perhaps they just did it all drunk; after all, there was enough vin chaud going round for that to be achievable. It’s what I would have done. It was an inspirational weekend. Despite my dig at the crowds, the wintery, nocturnal spirit of the whole event made me feel quite festive. Perhaps the most amazing thing was that it was all free, and perhaps within that, the sense of providing an event where an entire community, both local and global, can come together and be inspired, let their imaginations run wild (for that is what I feel is the true essence of the Fête des Lumières), was what made it so special. It’s understandable why, after Oktoberfest, Rio’s Carnaval, and Kumbh Mela in India, it is one of the most visited events in the world. I feel privileged to be living within arm’s reach of it. I could have quite easily spent my entire Year Abroad elsewhere in France and never known it existed. It was a wonderful way to see off my first semester at the ENS and, with all the cheesy cheese possible, as the nights draw in and the first half of this year comes to an end, it’s provided a beacon of hope as I look towards 2015 and the semester to come. Don’t give up on Strasbourg! You need to go again! 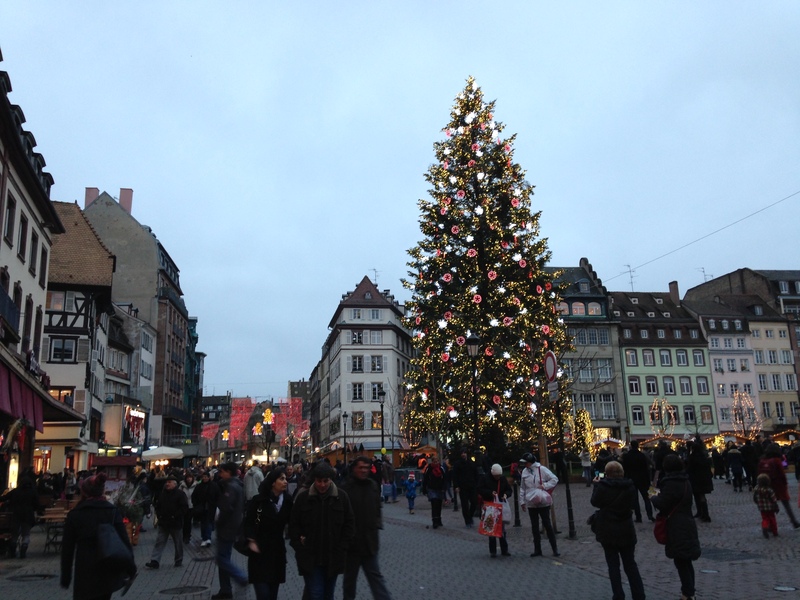 As someone who has been to Strasbourg at Christmas at least ten times and stayed there at Christmas, my view is that you need to know where to go, and when (which isn’t Sunday – you should see the autoroutes into the city on a Sunday in December). Another time try Thursday evening, after the shops are closed and stay late. Wander the city and have a meal at Chez Yvonne (S’Burjerstuewel) or Zum Strissel or any number of other winstubs for atmosphere. Almost everyone famous in the entire world has eaten at Chez Yvonne, from Bill Clinton to Jacques Chirac to Sarko to pop stars downwards. And us. We were lucky to have suggestions from my f-in-l who visited the city regularly and was taken out a lot. We will do the same for you one day. I love seeing le Grand Sapin in place Kléber at night, but in the daytime le marché des délices de Noël d’Alsace at place d’Austerlitz is where you can watch crafts bakers making the traditional Bredle (biscuits) and bonhommes de neige (bread ones). The only time I’ve found Strasbourg at Christmas stressful was one year when there was a windchill of -27° and I felt as if my skin was about to be peeled off like a rubber glove and blown away across Europe. 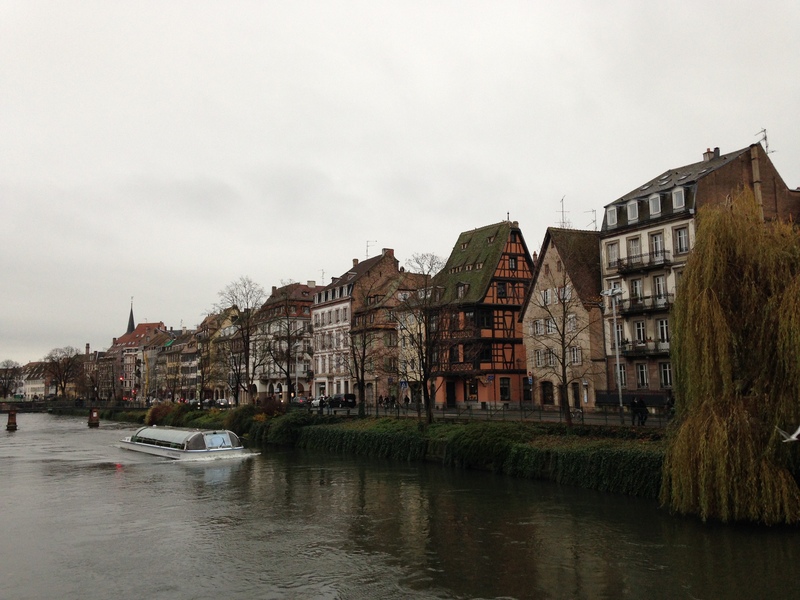 Strasbourg is one of those special cities where you can feel history layered tangibly in every street. Having said all that, Lyon sounds amazing and the images are spectacular.